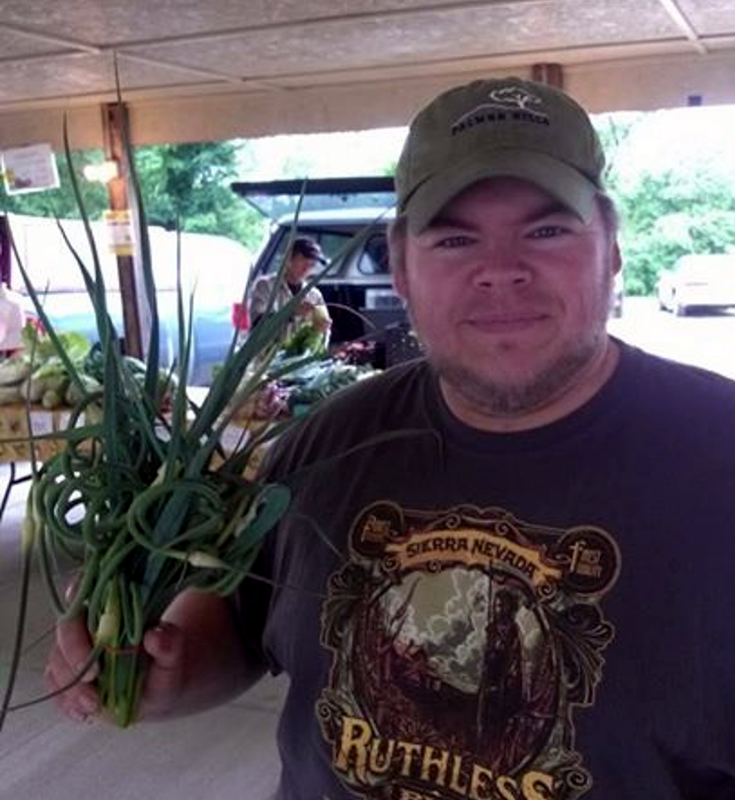 Guest “Market Gent” Frank Reiter is a huge booster of local foods and shares with us the info below on garlic scapes which are still in season. You can find them at many southwest Missouri markets. But don’t wait! The season is short. Garlic scapes are the leafless stem that shoots up from the garlic bulb that produces the flower of the garlic plant. When first emerging, the scape curls, with a slight bulge toward the top of the stem. To achieve the best growth and formation of the garlic head, and cloves, these scapes need trimming within a couple of weeks of appearance. Many farmers take advantage of these scapes and sell to the “in-the-know” culinarians, or foodies, at local farmer markets. Scapes become available only one time a year: late spring and early summer. A very short-lived season, coupled with great versatility, make garlic scapes a highly sought after item in many markets. 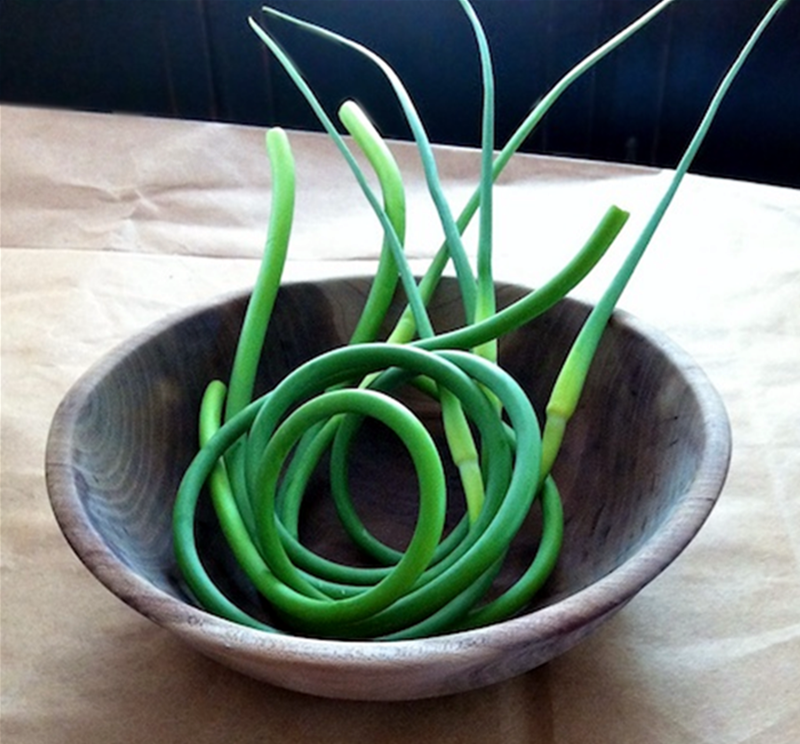 The scapes are only truly good when curled, with the very slight bulge. Once they begin to straighten, or flower, they become too woody, and lose much of the desired flavors. The flavor within a garlic scape can be described as a cross between a scallion, or green onion, and garlic. I’m not gonna lie to you… it is sharply garlic. You know… the kind of garlic that bites your tongue. However, I am from the school of thought about garlic never being too much. One of my favorite quotes is by Emeril Lagasse: “Once I was asked, ‘Emeril, how much garlic is too much?’ I replied… ‘Dunno… ain’t been there, yet! '” If you eat garlic scapes, definitely double, triple, up on breath mints, that day! When preparing garlic scapes for cooking, be sure to trim off the tops, just below the bulge. I used my two bundles to prepare a garlic scape pesto. As with any other pesto, there are a lot of ways to prepare it. For garlic scape pesto, you could use the scapes as a substitute for basil, or mix half and half with some herb, such as basil, dill, arugula, spinach, or chervil. For the nut component of the recipe, you could use pine nuts or walnuts. Below is the pesto recipe I used, and adjusted accordingly to my desired outcome. 1. In a small sauté pan, over medium heat, toast the pine nuts. Constantly stir, or toss, to get a very light golden hue to the pine nuts. Usually when you begin to smell them, they are done. Set aside and allow to cool for a few minutes. 2. Place toasted pine nuts, scapes, lemon juice & zest, salt and pepper into the bowl of a food processor, pulsing until all chopped and incorporated well. 3. Begin drizzling in the olive oil as you continue to pulse, or run, the processor. 4. Scrape the pesto into a bowl, and stir in the Parmesan cheese. 1. Pesto can be frozen. If you are going to freeze the pesto, do not add the Parmesan cheese until you are ready to thaw and serve the pesto. 2. Freezing will mellow the sharp garlic flavor of the scapes in the pesto. I served mine fresh, but it did have a substantial bite, at first. The longer it sat in the refrigerator, the more mellow it became. 3. 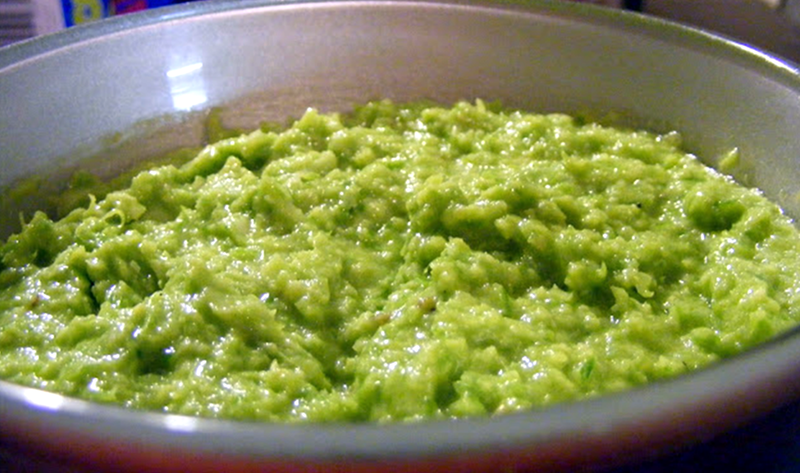 This pesto can be served on toasted breads, or tossed in with hot pasta. It can also be tossed in with a cream sauce for pasta. A small round of toasted baguette, topped with some pesto, and finally topped with a grilled shrimp makes for some amazingly simple, yet elegant appetizers at a gathering. Chop them up and put in a freezer bag, then when you need some just grab what you need. I usually do this with green garlic.